Where we found a general upward trend to a trend line plotted through a scatter plot of ‘nearby’ stations listed in the order of presentation on Wunderground. We also found a very significant increase in the Airport temperature when compared to the average of ‘nearby’ stations (tossing out the highest and lowest as potential ‘outliers’). 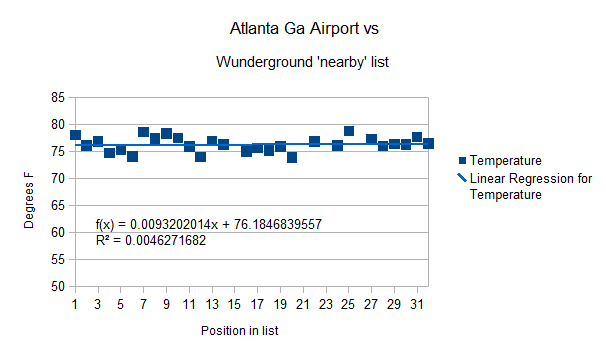 I then went looking for a 3 rd station and ran smack into Atlanta, Georgia that had 2 identical highs and 2 identical lows ‘nearby’ (so do I toss out one of each, both of each, or none?…) and had a flatter trend line (but the Airport temperature still above the average). OK, I can now either ‘cherry pick’ number three, present Atlanta as #3, or add another item #4 as a continuation and see if Atlanta is less like the pattern or if the next one matches it or matches the prior two… So I’m doing two in this posting. 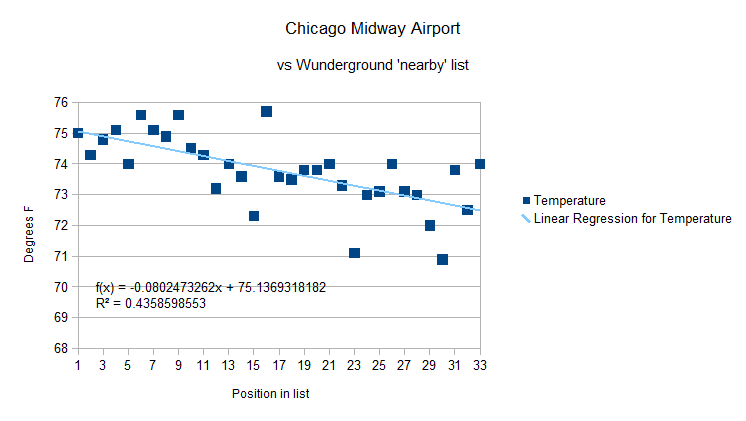 Turns out the fourth one tried (Chicago) is very much like Salt Lake City and Reno Nevada… So at this point we have 2 patterns: Rising temperatures as stations are higher in the list and nearly flat trend line with list position; but in both cases with the Airport above the average. In this comparison I also wanted to answer the question of “How much does tossing outliers matter?” so there are 4 graphs total. With and without the outliers. For Atlanta I toss all 4 or keep all 4 as I have no reason to pick one of the two identical temperatures over the other. For the ones with the data removed, I left the position in place, but blank, so the length of the graph does not change making visual comparisons easier. With that, here are the graphs, the average and delta to average temperatures, and the data sets I snagged. While the mean is 73.77 and 71.50 F for the all data and the H/L left out versions. The “differences” are 1.23 F and 0.68 C for the first (all data) case. 3.50 F and 1.95 C in the second (high / low left out) case. For Atlanta the airport temperature is listed as 78 F.
While the mean is 76.35 and 76.33 F for the all data and the H/L left out versions. The “differences” are 1.65 F and 0.92 C for the first case. 1.67 F and 0.93 C in the second. It looks to me like tossing the high and low has a minor impact, but doesn’t change the conclusion in any significant way. 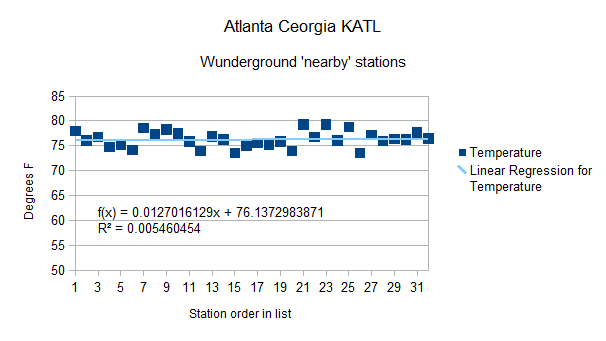 It also looks like though Atlanta has a different distribution of stations down the list (in terms of temperature trend) the station at the airport is clearly still reading above the average. Now I’ve taken a load of rocks tossed at me by Warmistas over my complaints about averaging temperatures. They repeatedly trot out the same old argument that averaging enough temperatures will fix the errors. OK then: That same argument says that the thermometers at Airports are WRONG and do not represent the average of the areas nearby and regularly report high values. I now respectfully request that all airport data be purged from any data set used for making policy recommendations or for use to show the presence of a “Global Warming Trend”. The averages show they are outliers. But a lot. Here are the data grabs for these two stations, perhaps folks more familiar with the area can make more sense of the patterns. Weather Underground Forecast for Wednesday, July 25, 2012. Wednesday and Thursday and become the main weather producer for the nation. across the Great Lakes, with the main threat of hail and damaging winds. Elsewhere, unsettled weather will persist over portions of the Gulf States. will keep scattered showers and thunderstorms going over the Four Corners region. temperatures will only fall into the mid-70s. 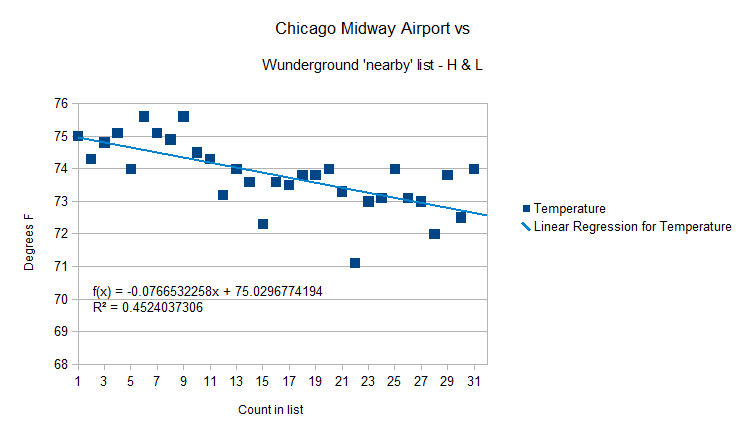 This entry was posted in AGW Science and Background and tagged Airport Heat Island, airports, Atllanta, Chicago, Georgia, Global Warming, Midway, Wunderground. Bookmark the permalink. Having flown in hot air balloons and taken glider lessons, I’m pretty sensitive to the “lift” you get near tarmac and runways… It can be dramatic in a glider.